I’m pleased to share the next piece in my #MetsMonday Featured Post series. This one comes from friend and fellow blogger, Abigail Johnston. Many of you will “recognize” Abigail as her online presence is certainly making an impact. Thank you, Abigail, for sharing your voice on Nancy’s Point. Be sure to scroll all the way down and share a comment or ask Abigail a question. It’s Spring Break, 2019. As I write this, my almost four-year-old son woke me up earlier than the others. We’re staying at the beach with family to celebrate the time the kiddos have off from school. My youngest son’s needs are simple. He still needs a bit of help in the bathroom, and he needs his breakfast—after some snuggles. Before anyone starts thinking I’m Betty Crocker, all I did was put his frozen pancakes in the toaster. Having alone time with either of my boys is a rarity, and I’m acutely aware I spent more alone time with my eldest before our second and last child came along. So, I grab moments alone with the little guy whenever possible. Whenever he’s sitting still is also a novelty, so there’s that too. I can think of hundreds of mornings so very similar to this. Lazy Saturdays, when there is no school or we’ve planned very little for the day. The slow start to the day used to be a luxury, something I had to plan for amidst juggling a household, a business, a career, volunteering and all of the other balls that are necessary to juggle in the midst of raising children. Now, whenever there isn’t school, this is MY norm. Hanging with the boys (the aforementioned nearly four year old and my newly turned six year old), making sure their needs are met and enjoying, most of the time, the quality time with them while they still want me around. I hear that ends at some point, so I’m soaking up the cuddles. From one side of the home away from home, we can see the beach, from the other, the bay. Each night, we can see the sunset over the water and each morning, the sunrise over the beach. Despite the really amazing location, the beach is nearly devoid of other people. We have seen one or two other beachcombers, but no one comes near us, and we stay away from them as well. It’s definitely one of my top five vacations. The boys have built and destroyed multiple sandcastles. My six year old has mastered the art of riding waves on a boogie board that is significantly taller than him. The boys rode roller coasters for the first time at Legoland, and we went down a bunch of water slides, despite the freezing water temperatures! We walked about five miles, according to my Apple Watch. We’ve eaten some pretty good food and enjoyed a few sweets we’d normally forgo. We’ve connected and reconnected with family and friends. There’s a storm cloud over the experiences, and I don’t mean the weather. You see, I’ve just passed my two-year anniversary of being diagnosed with breast cancer. I wouldn’t find out until June of 2017 that the correct diagnosis was Stage IV metastatic breast cancer from the beginning. So, two years ago, I was still planning for the scheduled lumpectomy and hoping and praying to avoid chemo and just get on with our lives. Now, I wish I had that to worry about—chemo was an experience with a beginning and an end point. The middle sucked pretty awfully, yet, it was finite and I counted down. Now, I only count up as treatment will never end. But continuing to take my targeted therapy means I’m still stable, a good thing. Living with Stage IV metastatic breast cancer has literally changed every single aspect of my life. All those balls I was juggling when I was diagnosed, I purposefully dropped most of them. Yep, you read that right. I dropped most of the balls I was juggling—ON PURPOSE. Now, rather than a career and clients and responsibilities to others, my day is framed by school drop-off and pick-up times. Now, rather than arguing in court, I argue with my six and three year old (they are much better negotiators that many of the adults I’ve known). Now, rather than taking care of myself last, I have to take care of myself first. Now, rather than pushing through the aches and pains of growing older, I rest when I need to and listen to my body. Now, rather than going to the doctor once a year (maybe), I have an entire team of doctors spanning many specialties, and I’m in a doctor’s office multiple times a week. This new life is very far from what I experienced before cancer and despite the fact that we live with the dark storm cloud of my truncated life expectancy hovering overhead, there is unexpected joy. The dividends from taking care of myself are many. Spending time with my children, I’ve found, has rewards far beyond my expectations. Rather than chasing elusive goals and often putting up with people that I wasn’t wild about, now I intentionally spend time with people who support and lift me up as much as I do the same for them. My learned skill of compartmentalizing various parts of my life or day from others has come in pretty darn handy. I’ve got an ironclad box in my mind where I can usually put and keep the cancer and 2-3 year life expectancy and friends’ deaths and progressions and fighting with insurance companies and doctors’ offices, etc. Most of that stays there—until it can’t any longer. When it bubbles over, there are a variety of things that sustain me, including and especially, my faith in God. Instead of looking back and mourning what has been lost, I have found contentment in looking forward while embracing the here and now. This isn’t easy or automatic, and I often have to remind myself to look up, to look forward, to breathe deeply and to focus. I don’t know how much more time I will have with my family, my husband, my children. But despite that storm cloud, I am determined to make the most of it, for as long as I possibly can. 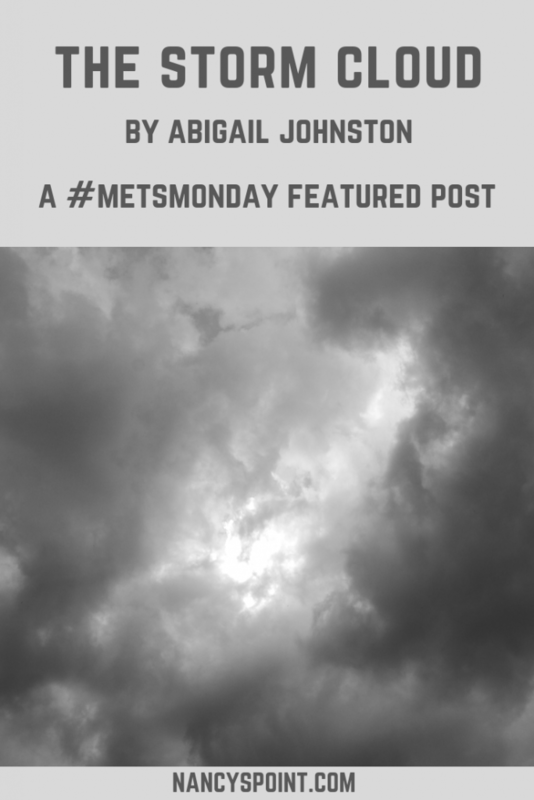 If you’d like to be a contributor for a #MetsMonday featured post, learn how here. 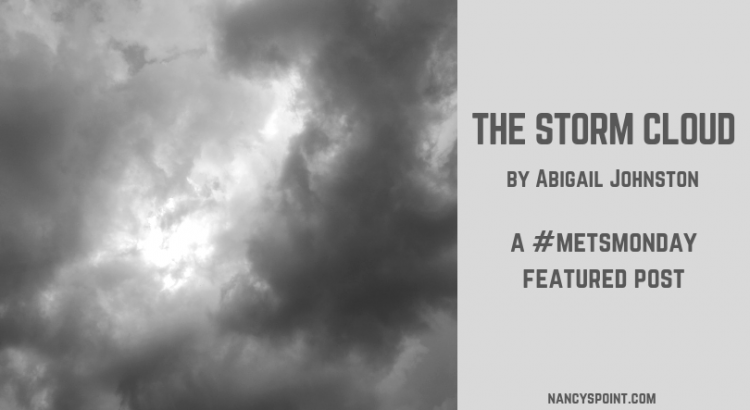 Are you living under the “storm cloud”, too, or do you know someone who is? If yes, what helps you compartmentalize? Do you have a comment or question for Abigail? Have you had to change or end your career due to cancer (any stage)? 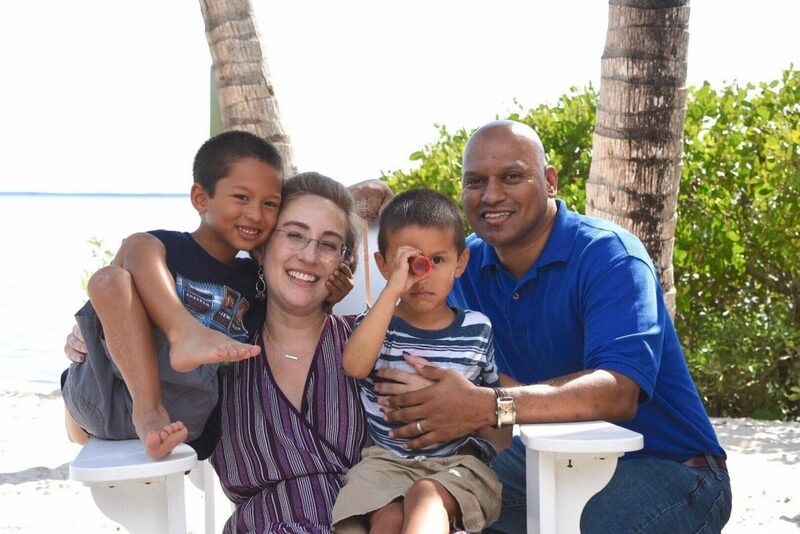 Bio: Abigail is a 40-year-old wife and mother living with Stage IV metastatic breast cancer. She lives in Miami, Florida with her husband and two sons. After her diagnosis, Abigail closed her successful law practice. She now spends her time with her family, advocates for more research and recruits lawyers to provide pro bono legal services for stage IV metastatic breast cancer patients. Be sure to visit Abigail’s blog, No Half Measures, and then don’t forget to like her blog’s Facebook page and the Connect IV Legal Services Facebook page as well. Follow Abigail on Twitter too! Yes! You are so right. Leaving a legacy is such important and worthy work. Love and light to you!! This post truly lifted me up. What a brave and courageous person you are!!! Thank you sooooo much! Love and light to you. As a woman living with Stage 4 MBC for the past 8.5 years, i can truly empathize with you Abigail. 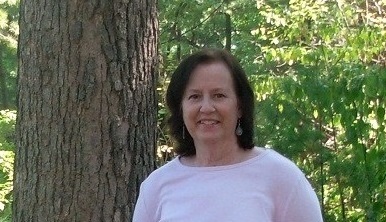 Although, my de novo diagnosis didn’t arrive until I was 65 years old & recently retired from a 45 year nursing career. My grown children already have children of their own. So i have experienced more of life and its various milestones. But I encourage you to continue on this path you’ve chosen. You clearly have your priorities in the right order! You must remain the #1 focus if you are to be a loving & caring wife and mother for as long as possible. I have been known to say, ‘If you can’t put more years into your life, put more life into your years. Stay the course my metsister…for you will reap more joys than many who are still on the career, work, family merry-go-round that demands more than they can often juggle. You are sooooo right! I don’t regret the time I spent building my career because all of that informs who I am and what I can now contribute. However, the very first thought I had when I was told I was metastatic was that I want to spend as much time as possible with my guys. That first, gut instinct has proven to be spot on. Love and light to you!! Thank you for continuing to share your reality. Helps me know how to pray…love and miss you, Abigail. Thank you, Adele! I cherish all of my prayer warriors and you especially. Love and light to you. What an uplifting post, Abigail. It’s so wonderful to hear that you are taking care of yourself, and finding unexpected joy despite your diagnosis. I have also been diagnosed with Stage IV breast cancer and, like you, I try to focus on the things that bring me joy. I suppose my version of compartmentalising is that I always tend to focus on the present moment and have never had any specific expectations (or worries) for the future. Whenever I stopped enjoying something (a job, for instance), I would simply move on to pastures new. How wonderful it would be if I could do that with breast cancer!! Yes!! Priorities are so much clearer now. We know how short life truly is and how important it is to follow our hearts to what is the most important. It’s a valuable wake up call with such gigantic downsides. Love and light to you.